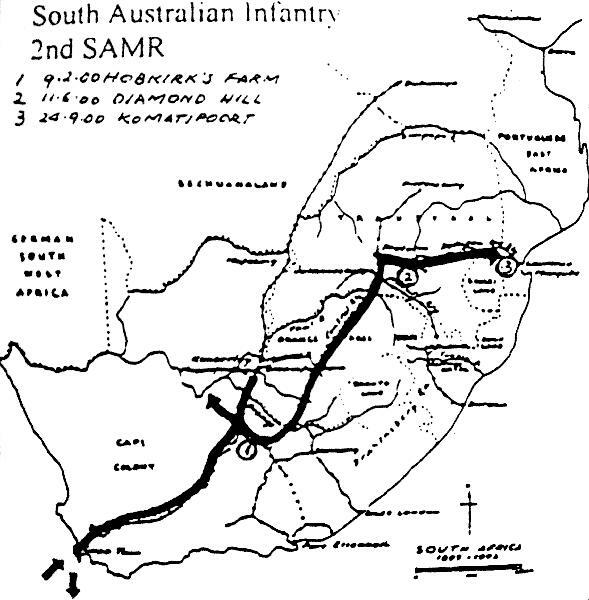 Map illustrating the activities of the 1st South Australian Mounted Rifles in South Africa, 1902. Murray, P. L., Official Records of the Australian Military Contingents to the War in South Africa, p. 307. Enrolled in the first instance, as a company of infantry; but mounted in South Africa. 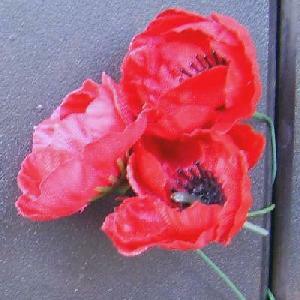 Preference s given to men who were or had been serving in the local other military forces. They were also required to be good shots, and to pass a medical examination as regards physical fitness. Establishment.- 1 captain, 3 subalterns, 1 medical officer, I colour-sergeant, 7 sergeants, 7 corporals, 6 lance-corporals, 1 bugler, 99 privates; total, 5 officers, 121 of other ranks. Captain G. B. Lascelles, Royal Fusiliers, accompanied the Contingent for special service, and acted as adjutant of the combined battalion. For pay, uniform, etc., vide p. 342. Captain F. H Howland, to be Major. 5th September, 1900. Lieutenant J. H. Stapleton, to be Captain, 5th September, 1900. Lieutenant B. M. Blair, recommended and approved for Captain, 10th December, 1900. Sergeant A. W. Johnstone, to be Lieutenant, 21st March 1900. The company embarked at Port Adelaide on the transport Medic, 2nd November, 1899, and disembarked at Cape Town on 25th November. They were encamped at Maitland until 1st December, on which day they entrained and proceeded to De Aar; from there marched to Belmont, where the Contingent formed part of the Australian Regiment under Colonel J. C. Hoad; vide 1st Victorian Contingent. On 10th December, marched to Enslin, under orders from Lieutenant-General Lord Methuen, to relieve the Gordon Highlanders. At Enslin the Regiment was hold in reserve for Magersfontein, but was not required. Returned to Naauwpoort about the end of January, then went to Rensburg, and from there to Maeder's Farm, where they were supplied with horses, and converted into Mounted Infantry. In the fighting which took place at Hopkirk's Farm (when the Boers with a very strong force attacked the whole of Clements' extended line), Lieutenant J. W. Powell was killed. Owing to the superior strength of the Boers, the force to which the regiment was attached had to fall back on Rensburg, and, eventually, to Arundel, where some casualties were sustained. From there the Contingent was sent to join the Berkshire Regiment, under Major M'Cracken. On the retirement of the Boers the Column, under General Clements, advanced to Norval's Pont, where the Regiment crossed the Orange River and took part in the march to Bloemfontein, under Major Dauncey of the Inniskillings. At Bloemfontein the First and Second Contingents formed the South Australian Mounted Rifles. In the retirement on Arundel, which commenced at midnight, 13th-14th February, 1900, the South Australians formed the rear-guard; a position of honour and responsibility, as General Clements' men had been without rest or sleep for nearly 48 hours. Notwithstanding these great exertions, Captain Lascelles, Royal Fusiliers, who was acting as adjutant, on arriving in the neighbourhood of Arundel, went back with a mixed body of volunteers, mostly South Australians to endeavour to bring in or assist some infantry who had been left behind. On the 20th, the Boers again attacked Clements, but were driven back. During the next eight days there was constant fighting, in which the Contingent took their share. In the advance from Arundel on the 28th, they formed the rear-guard. When General Clements was preparing to cross the Orange River (8th March), the South Australians were sent forward to the front at Norval's Pont, where they were in contact with the enemy until the 15th, when the force crossed. During the march through the Orange State, the squadron was on the right of the Column. For further particulars of service, vide Second Contingent. The Contingent embarked at Cape Town an 3rd November, 1900, in the transport Harlech Castle, and disembarked at Adelaide on 30th November. Granted a bonus of 30 days' pay by the South Australian Government Disbanded, 30th November, 1900. Captain Humphris and 25 men of the Second Contingent, having urgent private business, returned to Australia with the First Contingent. Murray, P. L., Official Records of the Australian Military Contingents to the War in South Africa, pp. 61 - 69. The Roll of Honour contains the names of all the men known to have served at one time with the 1st South Australian Mounted Rifles and gave their lives in service of Australia, whether as part of the 1st South Australian Mounted Rifles or another unit during the Boer War.